One of the problems that comes for one project to another is creating of expandable and easy to reason about architecture. In the world of React under the word “architecture” we mean the splitting of responsibilities across special components dedicated to doing the only one thing. In this article, we’re going to take a look at how to implement it. A small disclaimer, that it’s a result of experience we got in the team which includes only web developers asking for some help from a true mobile department. Let’s talk about this layers closely one by step. Pay attention to the importing of the Home container, defining the `goTo` methods to use it inside a View component reacting of clicks, grabbing an id from params. 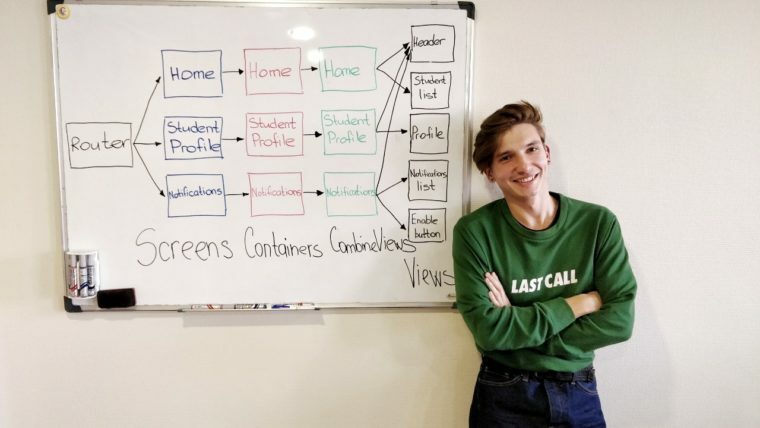 The layer of containers is a data boss: grabbing data from the store, transforming it to more suitable for a view shape, storing some minor state which is dedicated only for this part of the app like shouldShowModal. Aaaaand views – working staff of your app. Views are small parts which we use to build up the app – buttons, checkboxes, headers, etc. And I’d like to say the following: keep it as simple as possible. You can achieve it by passing as simple props as you can (a string, not an object i.e), reducing the state and the size of such components. It gives you an ability to reuse your code by constructing a big component from the small ones. The approach of arranging business logic helps us to clearly know what goes where not polluting containers or simple views with state and methods. Piece! It’d be great to look at your ideas, so that go ahead and share your thoughts about approaches how the community can do better React Native apps.